Find out seven useful tips that will help your kids overcome their fear of the dentist. Every parent knows how important it is for children to learn to take care of their teeth from a very young age. One’s teeth have the best chance of remaining healthy for a lifetime if excellent dental habits are reinforced in early childhood. Regular visits to the dentist help maintain optimal dental hygiene, yet children can sometimes develop fears that make a simple process overly difficult. The following seven tips have been provided to help children overcome their fears of the dentist. Children have potent imaginations and sometimes fear the unknown. They lack the ability to rationally dismiss their fears like adults can. They may have overheard snippets of conversations about dentistry or picked up wrong information from friends, TV shows, or movies. Some children truly believe that going to the dentist will be a terrible experience even though they’ve never been to one before. The first key to reducing any fears your children may have about visiting the dentist is to not increase them by speaking negatively of your own dental experiences. Be mindful of not using words such as pain, hurt, scared, or needles and never speak about extractions, root canals, or injections. These procedures rarely apply to young children and may needlessly add to their fears. Use language that kids can relate to and don’t over explain or add unnecessary detail. Keep the conversations light perhaps by saying the dentist is a friendly person who loves helping with teeth. The dentist can help keep your teeth healthy, white, and strong by using a special toothbrush. Let them know how good their teeth will feel afterwards and that their smile will be even brighter. 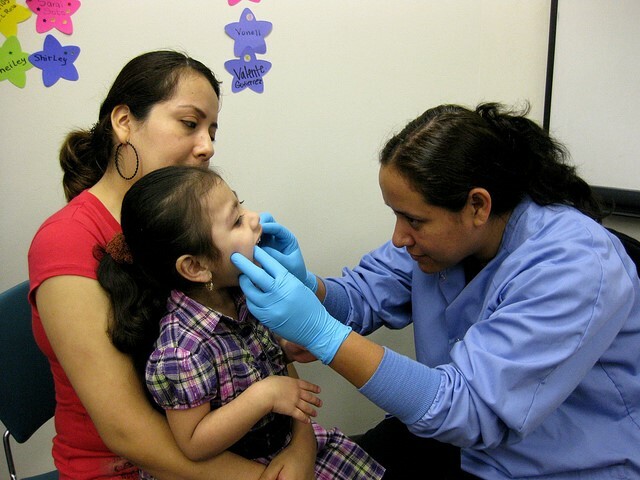 Role playing can help children prepare for a visit to the dentist ahead of time. Set up a pretend dentist’s chair and take turns in playing dentist and patient. Use a little mirror to look at each other’s teeth and try counting them. Encourage your child to pretend to examine and brush the teeth of their toys. Playing dentist is an excellent way to rehearse and demystify the experience. There are many excellent children’s books, cartoons, YouTube videos, smart phone and tablet apps, songs, and short stories available to help children understand what visiting the dentist involves. Your local library may carry some of the more popular titles or could possibly order them for the benefit of the community at large. Titles that dentists repeatedly recommend are: Behold No Cavities! A Visit to the Dentist (SpongeBob SquarePants – Nickelodeon), Tooth Trouble by Jane Clarke, Just Going to the Dentist by Mercer Mayer and Show Me Your Smile! (Dora the Explorer). Seek referrals by asking friends, other parents and health professionals for their own personal recommendations. Speak or meet with the dentist Sydney prefers most to get a sense if they seem genuinely warm and caring. Are they approachable and friendly? Can you easily imagine your child feeling comfortable, confident, and relaxed in their presence? Does the environment seem pleasant and inviting? Trust your instincts and keep looking until you find the right fit for you and your child. Paediatric dentists specialise in the treatment of children and their practice will be designed accordingly to really appeal to kids. There may be games and toys in the waiting room as well as bright colours, posters, and cartoon characters adorning the walls. Children associate such spaces with fun and definitely feel more at ease than in a strictly clinical sterile looking setting. If your child is particularly fearful, consulting a paediatric dentist may be well worth considering. Dentists are generally caring people who will have seen many hundreds of young patients and know exactly how to reassure that your child have a positive dental experience. Good dentists will use stories, distraction, and a technique called Tell-Show-Do. They will tell the child what they are going to do, sometimes with the aid of models and diagrams and also show them the tools they will use before proceeding with the actual work. Try and schedule dental appointments early in the day when your child is less likely to be tired or irritable. Things will definitely go much more smoothly!